Ms Splosion Man’s the type of girl who would really blow your mind – literally. 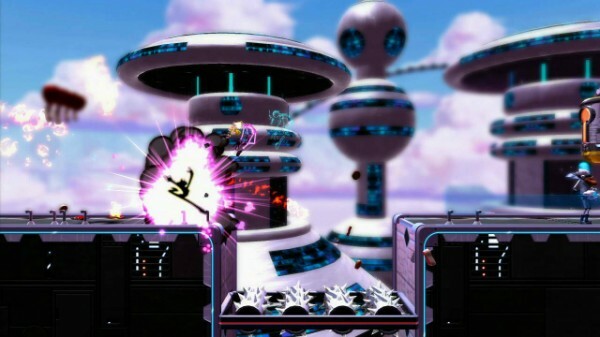 Since the game debuted on XBLA in 2011 (which by the way, you can read our review here), Ms Splosion Man has gained a notable fan base and a reputation for a pretty damn good platformer. Years later, Ms Splosion Man has gone mobile with a few changes for better or worse. Regardless, there aren’t many platformers on the iPhone these days of this quality and is a must-buy for platform fans. Ms Splosion Man is as simple as it is fun. Believe it or not, but in Ms Splosion Man, you play as….Ms Splosion Man – a hyperactive, scientifically created, female person-thingy that can blow herself up and survive because she’s made out of explosions or something. Whatever, it doesn’t matter. What does matter is that a bunch of mad scientists are trying to stop her from getting through cleverly designed platforming levels that are filled with creative and unique puzzles. Players simply tap virtual buttons to move the adorable suicide bomber left and right and tap the screen to ‘splode which will launch her up in the air. Like jumping, but cooler. This can be done up to three times and single handedly becomes the only logical explantation for double-jumping in video game history. These explosions must be timed accurately, giving the game a sense of much-needed rhythm. So not only do you have to be smart with your jumps, you got to make it flow well too. The best part about naviagting these greatly designed levels is that the controls are so precisely accurate that your always feeling comfortable within the game world. This may seem like such a standard thing, but I’ve found many platformers fail to do this on mobile devices so this is a huge plus. What works so well for Ms Splosion Man is how well everything is mixed together – It’s fast paced gameplay but it requires rhythm and brains. What? Yes. It’s a wacky combination but it feels natural and most importantly fun. With 50 levels across 3 worlds complete with boss battles, Ms Splosion Man is more than generous when it comes to content. The mobile port of Ms Splosion Man is very faithful to the original XBLA title. The gameplay for the most part feels spot on. The biggest flaw in the game however is a new feature – in-app purchasing, freemium style. Don’t get me wrong, I have nothing against freemium games when they are fair, but I have this silly belief that freemium games should be free. So with Ms Spolosion Man being a $3 title it’s a bit much to ask for more money, especially when some of these purchases are around the $5 mark. 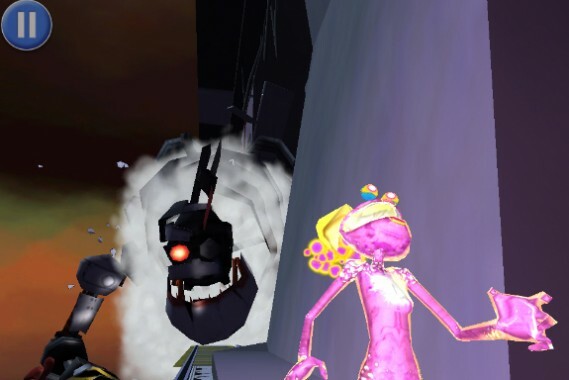 This generally wouldn’t be frustrating, but with Ms Spolosion Man the entire game has been redesigned around this model and interferes with the gameplay – all with the intention of sucking money out of your pocket. No longer do you unlock levels, now you purchase them with in-game currency. If you can’t afford them, you’re forced to replay levels you’ve already completed to earn the cash or make an in-app purchase which is probably what the developers are hoping you do. This is pretty disappointing as if the developers could have just left the game how it was, but now the game is slightly more frustrating when it never needed to be. Top it all off, Ms Splosion Man can get incredibly difficult especially towards the end, so replaying these levels can on occasion be undesirable. However not all of these in-app purchases are bad, as new power ups and such are available to purchase which is pretty sweet as these aren’t forced on the player at all.Furthermore, exciting new challenges have been thrown into the game to help you earn currency to pay for these, which adds a brand new level of depth and challenge to the game which is a nice touch. This is one hell of a beautiful game, and I’m not just saying that because of Ms Spolosion Man’s ‘splodin body! Everything looks just as remarkable and charming as the XBLA title, with fluid animation to go with it. What’s impressive is there is a ton of action going on the screen and there is never any slow down at all. To capture all this action, the screen is zoomed out quite far. This may be annoying for some players but it’s for gameplay purposes so it’s forgivable. Audio is also a stand out of this title, with girly pop culture references and humor spoken throughout, and nifty songs about everybody loving doughnuts and such. 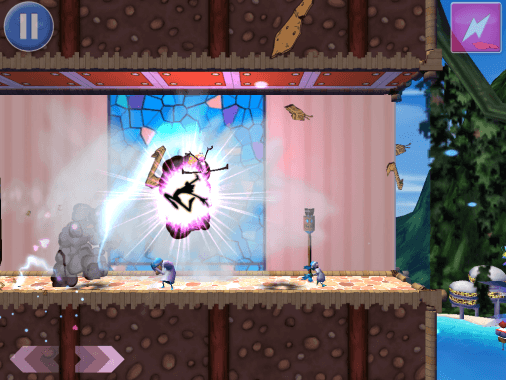 It’s rare to find a game that has audio that captures the same charismatic elements of it’s quirky style, but Twisted Pixel have hit the nail on the head with Ms Spolosion Man. Without a doubt Ms Splosion Man is one of the best platform titles on iOS devices. The amount of charismatic character in the game’s quirky design is so engaging that it alone sells the game. But throw in excellent level design and comfortable controls and we have one hell of an awesome cocktail mix. However the in-app purchases seem a little bit too much which will create a little frustration for some gamers and may steer others away. That being said, it is for the most part a very faithful port of the original XBLA title and is a hell of a lot of fun to play. Ms Splosion Man is ‘splodin with goodness and is a guarantee to blow you away!